In the exploration for a closer campsite, this was what I expected. I got precious little of it. 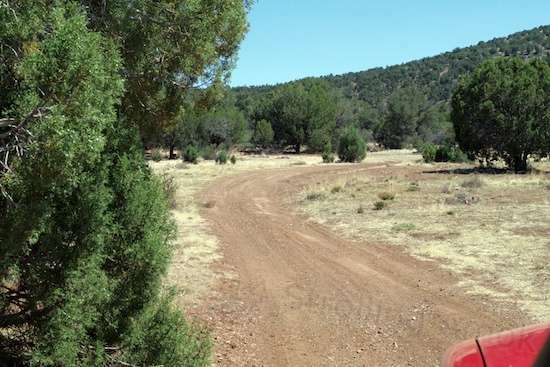 With every run to Safeway and other stores in Chino Valley, AZ being at least 14 miles each way, I decided to check out two other camping trail possibilities that practically glowed on the Forest Service’s Prescott National Forest Motor Vehicle Usage Map (MVUM), the only valid guide as to what’s legal to camp on and what will get you a citation. 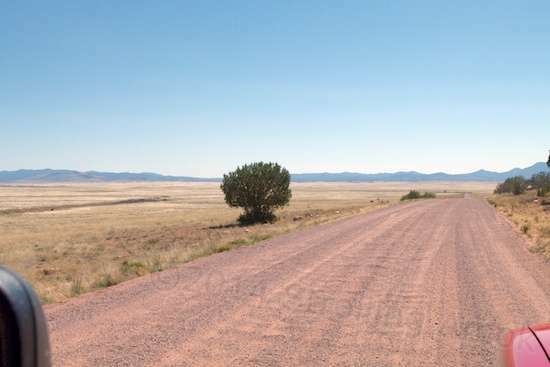 Heading east out of the upper end of Chino Valley is Perkinsville Road, a paved 35 MPH road that quickly turns to somewhat washboarded dirt. It stays paved for awhile because the town’s baseball diamond is located a couple of miles out. After that, it’s meat processing centers, ranches, and a cattle auction place. My interest was in finding a reasonably workable campsite that would cut some of the fuel cost of getting to town for supplies. Off of Perkinsville Road, NF (National Forest) 638 was indicated as cutting northward. Failing that, NF 641 and NF 163 did the same just a little further out. All were clearly marked as officially approved roads for motor vehicle access and camping. Old 89, or NF 9711F where I’m staying, is similarly marked. Except for a few sinkholes and a scarcity of places to pull off that won’t risk setting fire to the tall, dried-out grass, NF 9711F is peachy. It’s just not particularly close to town. Was there better? I intended to find out. My first clue was that, in looking for the turnoff for NF 638 off Perkinsville, the MVUM indicated a direct hit while a barbed wire fence on my left was continuous and signed as private property. Hmmm. No turnoff. Okay, proceeding ever eastward produced Haystack Road, an access road to a real estate development that would lead to NF 638, only higher up. Heading up 638 and jogging to the left to continue on produced some washboard gravel that went on for quite a ways. Then it lead to a mish-mosh of paths in an undefined, rutted dirt area that promised fun times for the unwary if it ever rained. The multitude of tracks and paths were the result of having to find a best chance through mud. I picked my way along and, thanks to the iPad, turned back to NF 638 northward. This went on for a ways too, and it was all slow going. As far as fuel consumption goes, the Ford can get 9 MPG at a rolling idle, which was what this whole stretch had been. For the miles of distance and time involved though, it was debatable already as to whether this trail would be worth it. Bouncing along at idle is far worse than twice the distance of gliding smoothly on cruise control at 65, particularly for a emission-controlled diesel. I couldn’t call these cattle grass-fed, but they are free to wander. I was surprised to see that this area was open range, basically. Cattle and calves, bored nearly to tears, carefully watched the big red truck idle past. They were all over the place! 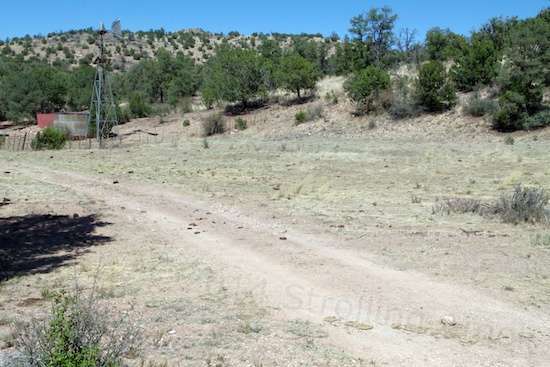 Then, at long last, a barbed wire fence with cattle guard, and the entrance to this section of Prescott National Forest. In I went, and saw a couple of level spots in meadows that adjoined the road and were uncomfortably close to it. Trails branched off this way and that, but I stuck to the approved road. I don’t think I was but half a mile in when I came to a commendably deep eroded cut running diagonally across the trail. End of game for the Defiant. For me, it continued to stay surprising to see all the roaming beef. This is the approach to the entry into NF land on 641. As far as I was concerned, it was the end of game for the Ford, too. She had a full load (70 gallons) of water in the Tankmin, and the bed was stuffed full as usual. You can hear the Ford’s door seals squeaking on really uneven ground because of the cavernous dual door openings on each side allowing body flex. Here, it looked certain that I’d use up all available suspension travel and then some, leaving two wheels in the air, diagonally. Looked like it was three feet deep. 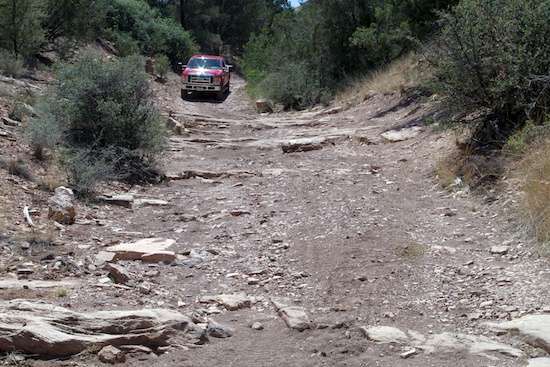 You can get stranded on diagonals like that with garden variety 4WD. No thanks. On my way out, I was passed by two campers in an older Bronco, so somebody was camping somewhere, in something. Once out, it was only a short distance back to NF 641, which headed east and then northeast. 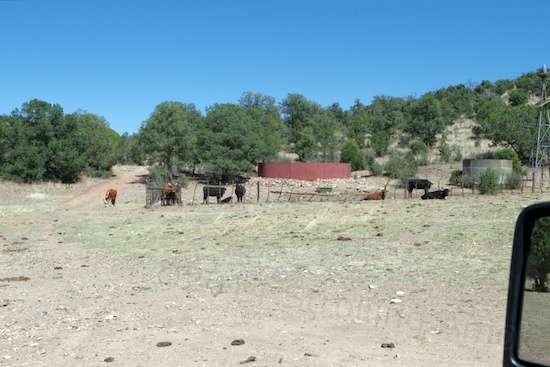 But this was still private valley land, with cattle. The “road” was actually a broad swath of bare dirt, rutted in a confused myriad of improvised paths. Simply sticking to the general direction and picking the smoothest tracks was all I could do. After a considerable distance, it was apparent that towing the camper would require several instances of very careful path choices. But it could be done – just not in the rain. Despite the desert conditions here, rain and mud are quite the issue in what they call the “monsoon season” that takes place in late summer. I’ll bet it’s something to experience. Many pleasant camping areas turn into inescapable mud bogs for the unwary. 638 and 641 promise to be in that category, in spades. A few miles later produced the actual entrance to the National Forest land, ringed in barbed wire and a cattle guard. At last, I wouldn’t be running cattle off the trail. In I went. 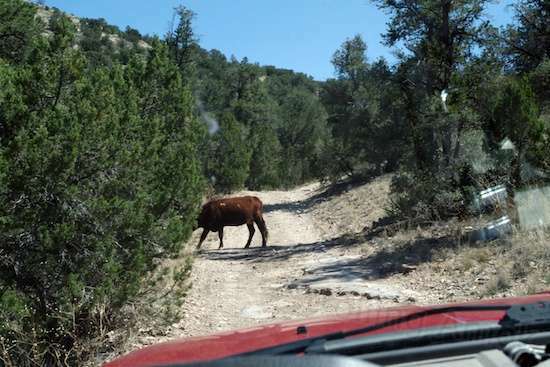 The dirt trail of NF 641 wound its way northeastward – and there were more cattle! A section of fencing at an adjoining corral was deliberately missing, and they were all over in here, too. Various agencies do lease land, so maybe something similar was going on here as well. 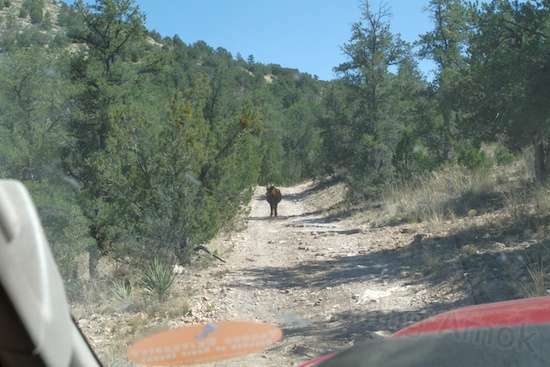 Some of these critters resembled longhorns, and all were intimidated by the vehicle. At least they weren’t buffalo or Brahma bulls, so I didn’t have to sweat my four layers of radiators in front. 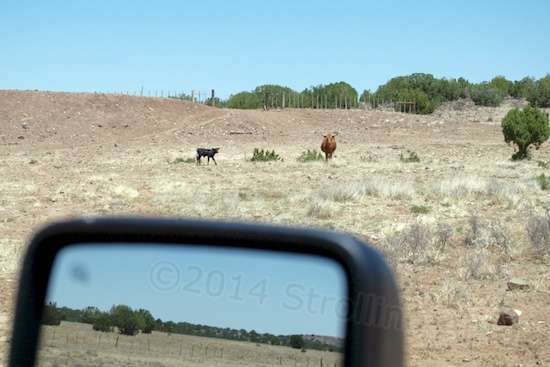 I hated to roust these two calves, but once the truck came close enough, they got up and headed for mother. The trail was bumpy and slow going as it twisted its way in. Soon came a deep dip caused by water flow, indicating the end of this trail for the Defiant. There had been no places to pull off the narrow trail, and from this point on, it looked like it would be “catch as catch can with” a van or other high-clearance vehicle. I kept going, however, because ahead lay the top end of NF 163 as it worked back toward Perkinsville Road. Maybe that would produce some easy pickings. So far, this whole area was a loss as far as convenient proximity to town went. Close distance, but terrible travel. One really good section on 163 could save it. but the shortest way to get to 163 was to keep going on 641. This first gully gave me pause to wonder what else may lie ahead. Sharp and deep dirt washouts abounded as the terrain turned into a mountain trail. 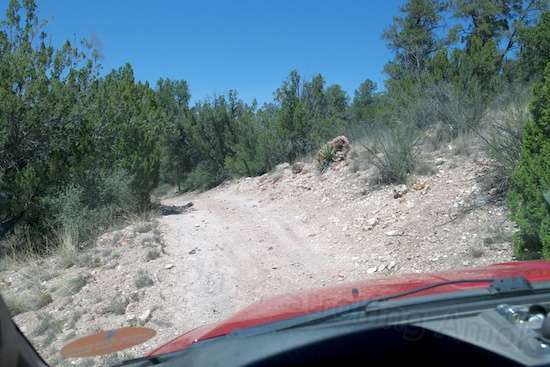 I kept memorizing potential turnaround areas along the way, in case I came to a gully so deep or abrupt that I risked grounding out the exhaust pipe or the side steps. I began hoping I wouldn’t meet anyone coming the other way on this thing, because there was no place to pull even partially over for very long distances. With the tailgate up or the bed loaded, rear visibility for backing up is much tougher. Then the trail got nasty. Change your mind or meet another vehicle, and you could have a very long back up to do, especially if their vehicle is as unwieldy as yours on narrow trails. I came to what I’d describe as a spillway, a dry one. 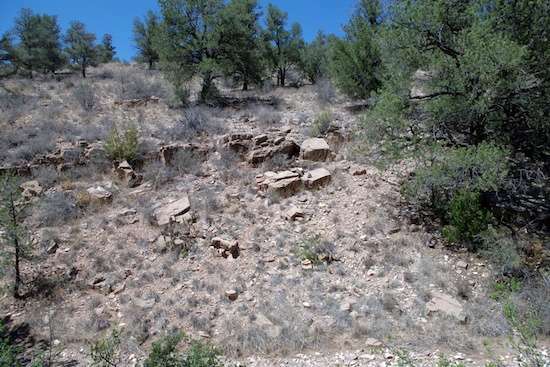 It was a rocky wash between two mountain slopes, and it was also the trail itself. 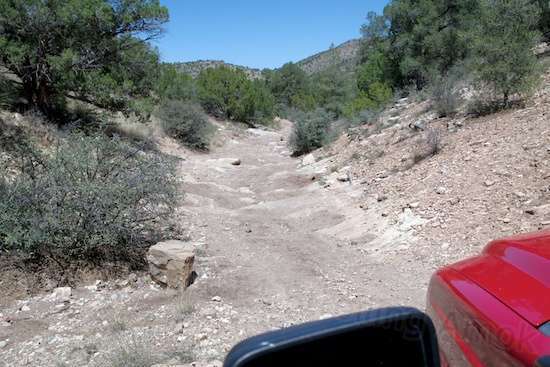 I looked down the run at a series of rock steps, thinking, “This is a pickup, a long-wheelbase pickup here, not a Jeep! Gimme a break!” I got out to look, because it was plain that I’d have to watch my path to avoid at least a couple of showstoppers that could gore the Ford’s vitals. Also in my mind was “Never four-wheel alone,” but I hadn’t intended to. It was either press on, or do one hell of a long back-up on a twisting, narrow trail, tailgate up. Uh-oh. Time to get out and take a look at what’s going on ahead, since it was plain that a couple of spots posed a hazard. Once I walked down the thing and picked the most promising path, it looked do-able. And it was. 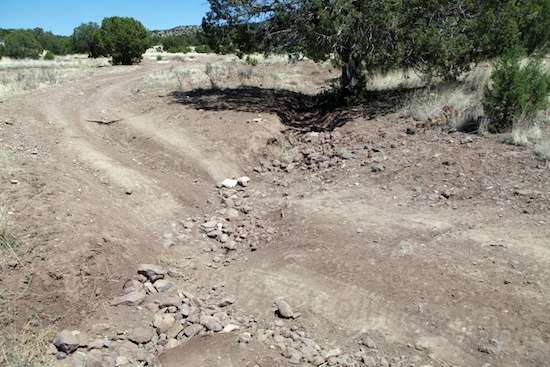 Then more winding, more deep ruts, and more deep cuts across. And more cattle. There were tiny perches here and there where a single vehicle could possibly camp, but for safety’s sake it would need to be a 4WD vehicle running solo. And not the kind of vehicle that would have to break camp every few days to replenish – the trip out was far too arduous to be worth a short stay. And if it rained, trying to retrace back up the wash on 641 and then 638 would be a very special event. A shot from partway down. The concern was not traction, but depth of drops and height of projections. Despite wondering what I had gotten myself into, there were plenty of beautiful areas that the Defiant would never see. I eventually made it to the end of 641, where it meets the north end of 163. 163 makes a drunken beeline back down to Perkinsville Road. Heading southward, NF 163 quickly revealed a few meadows that presented, amidst a wealth of cow pies, some level, camp-able meadows big enough even for the unwieldy Defiant. I noted GPS coordinates, reset the trip odo to measure the distance into town, and pressed on. Then I scratched out the coordinates because of the characteristics of the trail. I had to keep an eye out for too sharp a drop on the right side, which would threaten the Ford’s oversized, twin exhaust tips. It was fine in general, but with far too many impasses for the trailer. Then I’d note another potential campsite, reset the odo again, and come to another problem with access. This was 2WD van and truck camper territory. I repeated this optimism several times until I came to one ravine that looked like serious trouble. Its approach was just too abrupt to not risk ground contact. But there was an alternate path involving an easy, open back-up of a few hundred feet. 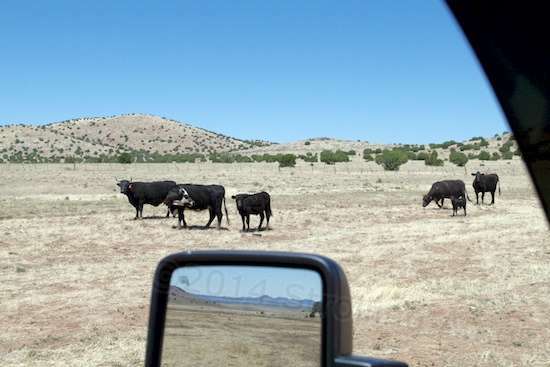 Near the juncture of 641 and 163 was a sizable herd of cattle. The meadow-like terrain evolved into mountainous trails again, but this time with gravel and broken rock on significant inclines. I might have made the worst of it in 2WD, but not without some drama. I didn’t want to tear up my expensive new tires, so turned the magic dial to power up on four and just drove. 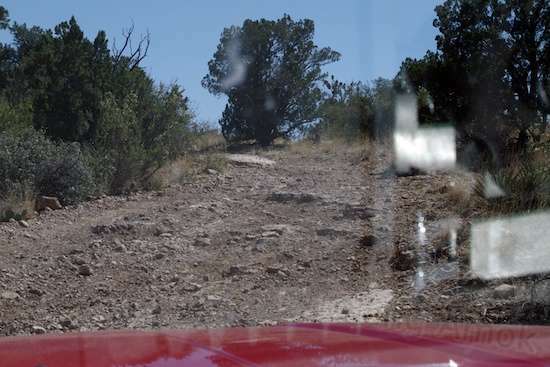 A steep, sloppy climb on loose rock was only a sure thing in 4WD. According to the MVUM on the iPad, I was approaching the home stretch on NF 163. Unknown to me, I was also approaching the worst yet, as far as the big Ford was concerned. I was another rock section with a series of steps cascading down, only a couple of the drops were deep and unavoidable. This is where you hope your shocks are still working (front: no, rear: yes) because the last thing you want is to carelessly charge down a high step, slamming 4.5 tons of expensive mechanical relationships into solid rock. Part of the climb involved step-ups, which require either suspension-punishing momentum, or an abundance of traction. I got out again and walked around, looking for the best way down the stepped incline. There was none. Oh, I briefly considered turning back and retracing two hours worth of sweaty tedium, but of course that was only for a few depressing moments. 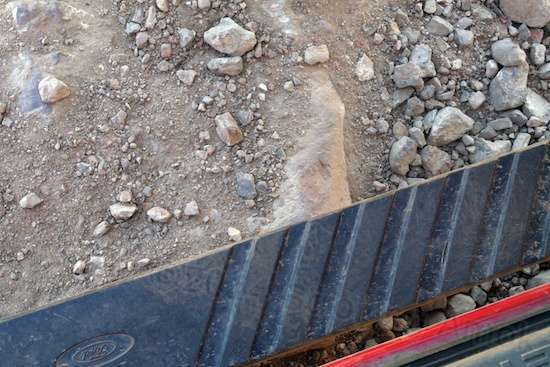 Then I eased ever so slowly down each step with the front wheels, and opened my door to see how close the rock step came to the truck’s running board. Wow! It was close, not much more than an inch, but no contact and no unwanted sounds. This was close enough, for my taste. I kinda hoped I wouldn’t be forced to go back up in reverse should the trail get even worse ahead. Once clear, I realized that the camping potential of this whole area was not only zero for me and the Boulevard Bomber, but for just about everyone but 4WD lightweight/pop-up truck campers and 4WD vans. 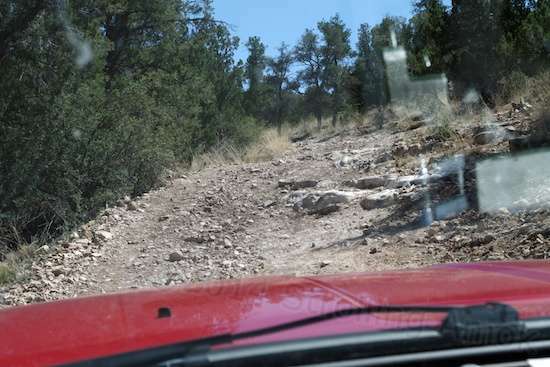 Could you make the needed climbs in 2WD? Maybe, in perfect conditions like I had. It depends on the specific machinery and one’s willingness to highly stress it. But I would not try it without a reliable “out” or alternate solution. A sprinkle of rain due in? Forget it. After the steps, a quick exit and turn into Perkinsville Road again, but now ten miles from town. Technically, a waste of several hours, but exciting ones. So, my quest for a closer campsite had failed miserably, and I’d almost bitten off more than I could chew in the search for it. Plus, I’d used considerable fuel. But I’d learned something. Go with the odds. If a trail doesn’t look very promising for your specific rig from the get-go, it probably ain’t gonna smell any sweeter the farther in you go. The diesel’s fairly quiet idle rattles geese and burros that don’t shy away from other vehicles. Cattle don’t seem spooked by the sound – they just don’t want to be in the way. 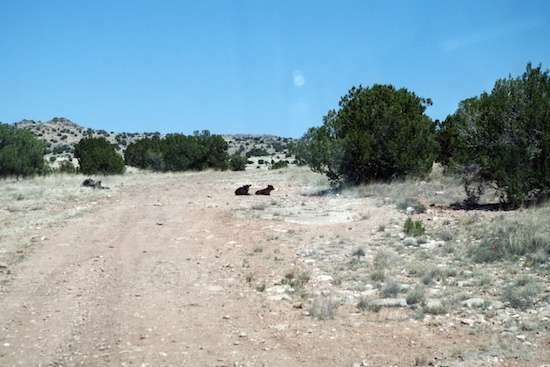 Considering the free-range aspect, many potential camping areas were littered with cowpies, a benefit only if you could burn them in cold weather, to stay warm. A goldmine for someone with a wood stove, I figure. And I would have been happy to talk you into going instead (with your own vehicle) John! My combo of cheap and lazy can be a real motivator sometimes! Wow! I thought those downloadable MVUMs looked promising until I read the rest of this blog. Thanks for the heads up. That looks as bad as the Peavine Trail turned out to be. 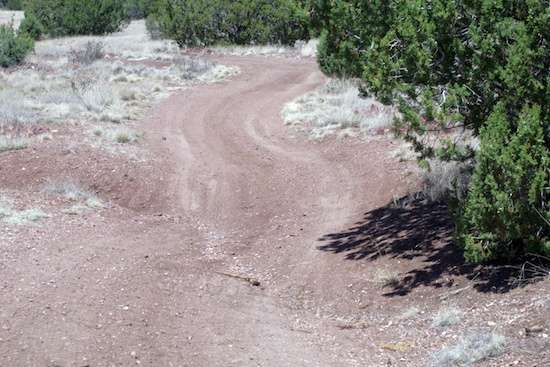 Is that the “East Peavine OHV trail” northwest of Reno, NV?